The engine on the bus has this pretty name H-074909X As you might have guess, this is a 1500cc Apparently not the original one. I don’t really know. 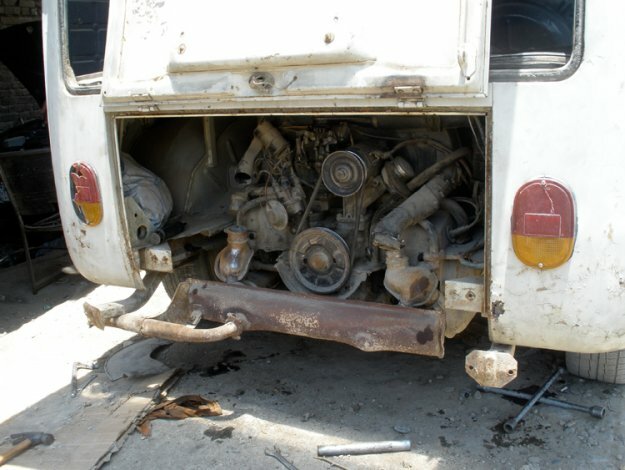 Buses for exportation might have received this kind of engine, but the numbers doesn’t match the frame. Anyway, it’s in really good shape for this age. X for low pressure. it’s a nice beast. Whatever happen engine and frame better have to get well together they’ll be under the same roof. Lost at the end of the container, after 10 days, the engine is totally dusty. We put it in a huge metallic plate to clean it with some petrol. This big pot is in fact a carter of a soviet tank ! Clever way to recycle. 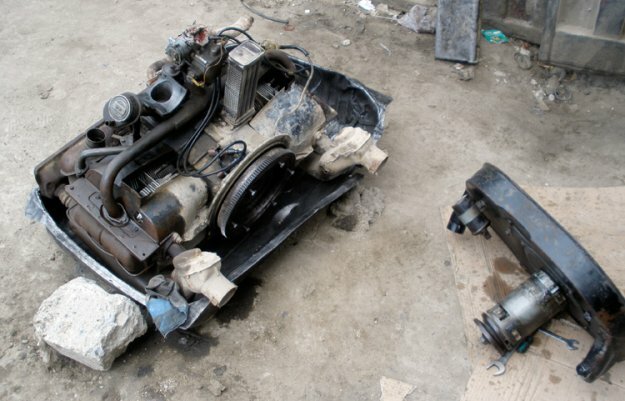 43 years of riding in Afghanistan made this engine totally greasy dusty. Even though it received a first deep cleaning at the car wash, there is still some petrified grease layers underneath. 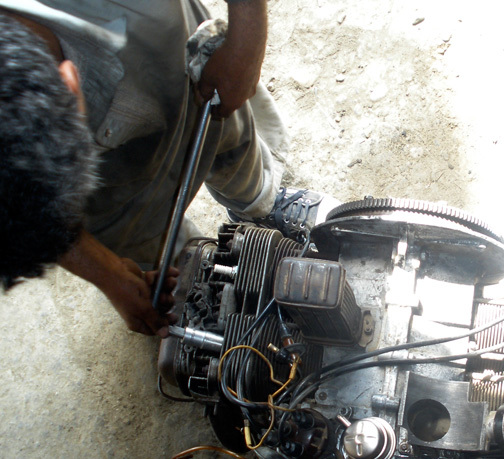 Fardeen one of the mechanics uses a special tool that he should patend. It’s a standard bicycle air pump filled with petrol. A hand pressured power wash ! pretty efficient, he can remove easily most of the dirt. A little fine-tuning with a brush and everything is clean within an hour. The engine has a good compression and no leaks, good to know. It will take to much time and who know how much it will cost. I would like to open the engine more deeply but can’t risk it. If necessary I will do it in Iran or Turkey where it would be way easier to find a more classic mechanics with a real counter and normal tools. The flywheel gasket is always a bit delicate to replace and his role is really important. We do that really carefully with one of the mechanics. Everything goes well. The clutch removal is a bit scary. The big bolt which holds the clutch is really tight. We can tell that this bolt gave some difficulties to the previous mechanics before. There are many dents on it. We have to get some leverage somewhere to unscrew it. Ideally an air powered machine would have removed it in 5 seconds, but there’s nothing like that here, so one of the Zulara decide to take a long metal bar and to put a big screw driver in one of the holes that anchors the gearbox to the engine. Now he has a good leverage but I’m not so happy to see all the pressure given to this aluminum part…. A few scary minutes, then the bolt finally comes loose. The clutch disk is as shinny as a mirror and has no more thickness. It’s really time to change it. I won’t find the same but the good thing in Afghanistan is that they can change only the disc. They remove the old pad and put in some new ones. 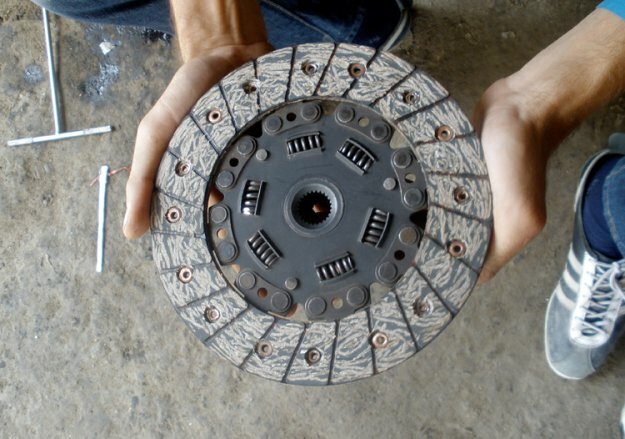 They do that for all the old clutch systems and for cars with shoe brakes. Belgian quality please !!!! One thing is certain is that this bus will be an international one. 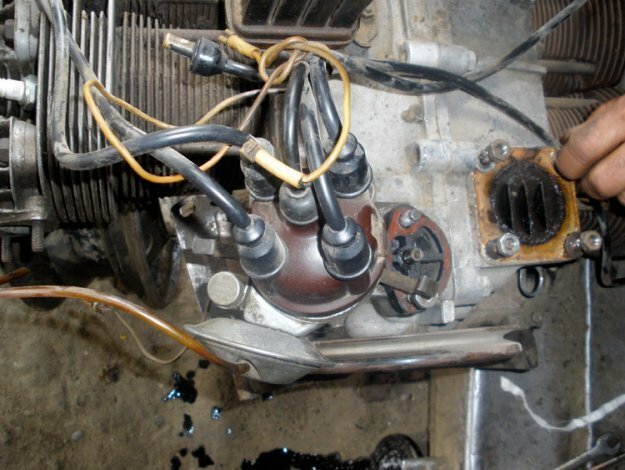 . .
We change the gas pump, condenser, pointer, the HT leads and put brand new spark plugs . They are a bit cracked. 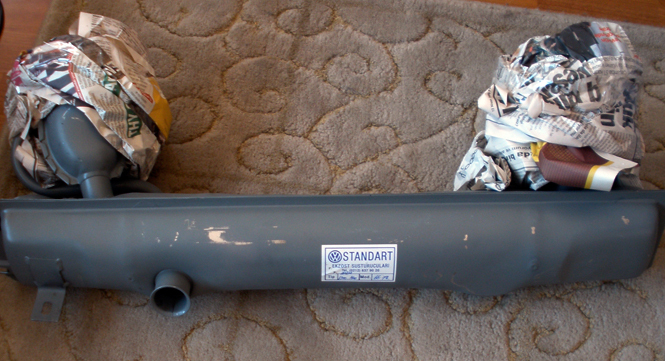 A new exhaust I purchased in Istanbul, there is a company that make them new, good quality and fair price. Everything is going well, no bad surprises. It’s really nice to have good spare parts when you rebuild something. Thanks again to SERIAL KOMBI for all these parts. We can say that the progression is going well. No bad surprises. 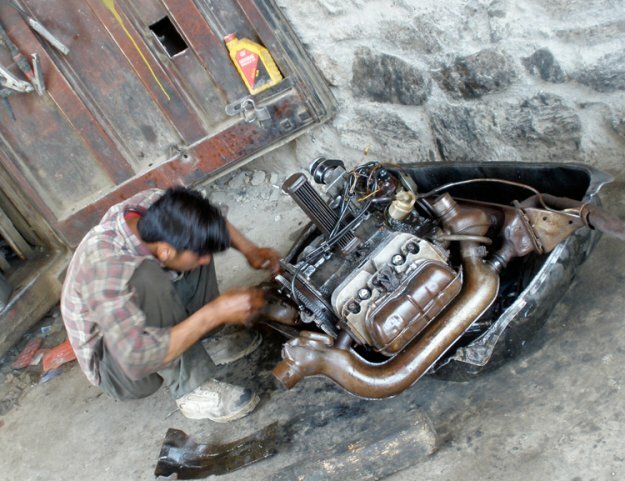 Suddenly a spirit catcher comes and proposes to protect the engine with an old Afghan technique. Awesome, a home delivery of a traditional protection. Let’s go for it. He throws some seeds in his tin box full of burning charcoals. A strong, heavy smoke with a really special, heavy smell starts to go everywhere. He use a fan to make it even thicker and pushes it toward the engine. My engine is now ready for the adventure. Check the gear box and change all the gear shift bushing.